SRH Gymnastics Club run by Premier Sport on Fridays after school has had a very successful half term. 40 children have taken part and these photographs demonstrate some of the recent skills of the children. These children are doing counter balances - sharing each others weight. Children from the whole of Key Stage 2 went to Christchurch Mansion in Ipswich over a week to take part in a series of Victorian workshops. Just like in Downton Abbey - we got to try out 'upstairs' and 'downstairs' activities. Whilst downstairs we made butter and did the laundry. Upstairs involved something called deportment - learning how to walk, sit and dress like a gentleman or lady. Members of our School Council at the entrance to the RSPCA headquarters in Martlesham, near Ipswich. Most of the animals have been brought in by members of the public such as this kitten and this young hedgehog. This dog has been injured and taken in by the RSPCA. This kitten was brought in overnight - our school council were asked to give her a name: we came up with Moonlight. This is a chinchilla - from South America. There were lots of rabbits at the RSPCA. the newsletter was incorrect, SORRY! there is NO ORCHESTRA on 7 November. 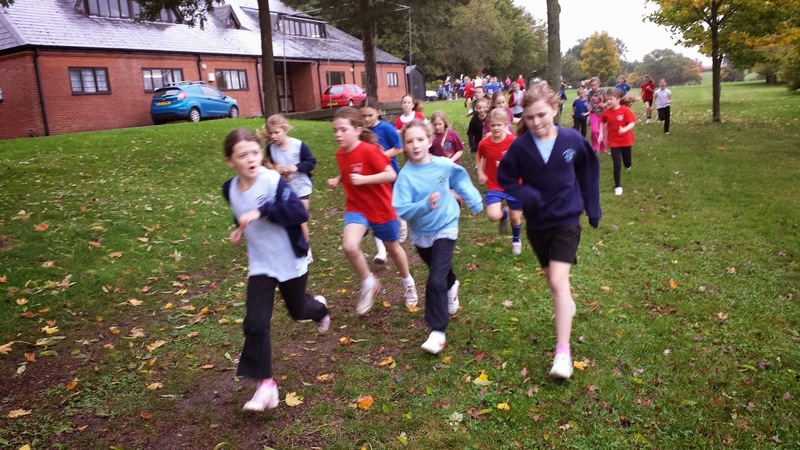 Robert Hitcham's enjoyed a successful cross country competition at Framlingham College yesterday. The picture above shows the individual medallists from the boys and girls races. Ethan Withingstall came 1st and Georgie Cantrell was 3rd. 2nd and 3rd in the boys race were from Debenham. 1st in the girls was Tilly from Devenham and 2nd was Monique from Charsfield. Ethan leading the way past Framlingham Castle. SRH also ran an inter house competition. These pictures show the various house teams. 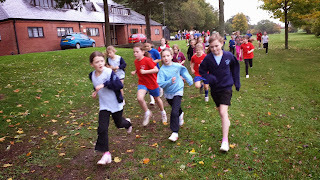 Howard won the girls race, Bulstrode won the boys and came 1st over all. More action from the races. 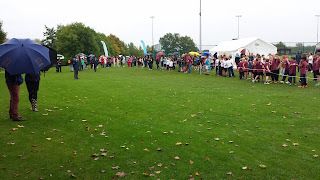 SRH had 10 girls finish in the top 25 and 5 boys - there were 9 schools taking part. (unless your child has been off school unwell). If you forget to pay Monday then you must provide a packed lunch for your child for the week. We recommend that you pay in advance for the half term either to the office or online. This Thursday photos of all individual children and family groups will be taken. The children will be photographed in their school sweatshirts. If you wish to bring pre-school children into school to join your family group photo, please come to the hall at 8.30am with your children. REMEMBRANCE POPPIES – hopefully on sale in school this week! for the children to purchase one if they wish to. If they arrive late we will sell them after half term instead. Applications must be made on-line or using the form by MONDAY 31 OCTOBER. DEADLINE FOR HALF-TERM PAYMENT IS MONDAY 11 NOVEMBER. If we do not receive a slip from you we will assume that your child WILL BE having a Christmas lunch which will need to be paid for on 16 December . The new date for Sports Day is Tuesday 24 June (with the reserve date on Friday 27 June). The change is due to Framlingham College theatre only being available in the week of 30 June for the Year 5 & 6 production. Just to advise parents there is no HHH this Wednesday or Orchestra on Thursday. Mr Byer will be running chess club for Year 5 & 6 children. It will be held on a Thursday from 12.30-1.15 in Mr Brooks classroom. We would like to give you advance notice of this charity bag collection, in case you are having a clear out over half term. They accept good condition clothing, bedding, belts & shoes (in pairs!). A letter and donation bag will be handed out shortly from the Friends. Your feedback from the workshop held earlier in the month is very useful to us. If you haven’t already handed in your feedback sheet, please do so before half term so that Mr Vaughan can review and take action from your comments. Thank you. On the first day back after half term the catering team are providing a Bonfire Lunch of Hotdog Sausage in a roll or Cheddar Cheese Catherine Wheel, Curly Fries, sweetcorn and BBQ beans, with Fire-Cracker cupcake for dessert. The closing date for this scheme is very soon, so if you have any vouchers please drop them in to the box outside the office by half term. Thank you for your support. The Friends film night after half term will be Monsters University, the booking letter is being handed out today. Please return the filled shoe boxes for Operation Christmas Child by Friday 8 November, don’t forget to include the £3.00 cash/cheque in the envelope or pay on line (apologies that we previously stated £2.50 in error). Thank you. (Note: Thomas Mills High School are in school on that day). KS2 pupils remember to sort your Victorian Costume ready for Tuesday 12 November. The closest house football competition for many years was decided on goal difference after Bulstrode, Mills and Howard all won 2 games each. Bulstrode, however, scored more goals than other despite losing a high quality match against Mills. Mills could have won the tournament but lost an exciting match by 3 goals to 2 against Howard. Picasso style self portraits by class DB. Beth Moodie (above) and Ruby Bolton (below). See video below for the whole gallery. We would especially encourage all new parents to school to come along. Do gather your family & friends to come along to socialize and have some fun. 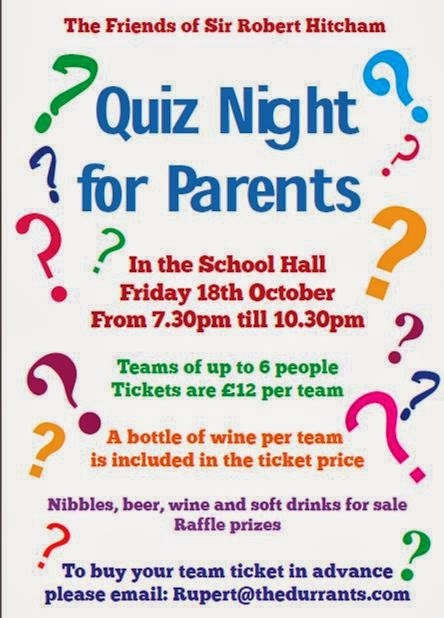 Pit your wits against other teams at this adult quiz evening with questions set by Mr Brook. There will be a licensed bar available. Each team is allowed up to 6 people and will cost £12 per team; this includes a bottle of wine on your table. Book via Rupert’s email above. There will be prizes for 1st and last place and best team name. Poppies will be on sale in the school during next week (21 October). They will be brought to the classes each day when the children will have an opportunity to purchase a poppy if they wish to. We now have the confirmed Sports Events dates from the High Suffolk Sports Partnership. Teams of pupils from Year 6 & Year 5 will be selected to represent the school at the following events. Letters will be sent home before each event if your child has been selected. Parents are often able to come along to support the teams, and Mr Brook may occasionally need help with transport. Next Thursday, 24 October, photos of all individual children and family groups will be taken. The children will be photographed in their school sweatshirts. With this letter please find the EATs catering menus that starts after half term. You can also find the link to the menu from the front page of the school website. Please can we remind parents of children in these 2 classes to collect your child from the playground at the end of the day, and not to wait outside the class door to get your child before their line walks down to the playground. Please keep the path and steps from these classes clear for the safe access of children down to the playground. Thank you. 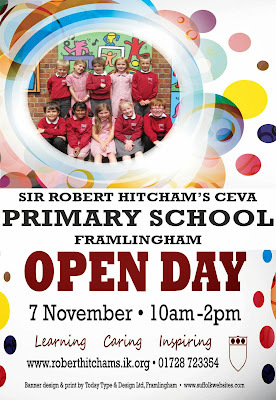 We are holding an Open Day for PROSPECTIVE PARENTS in November. 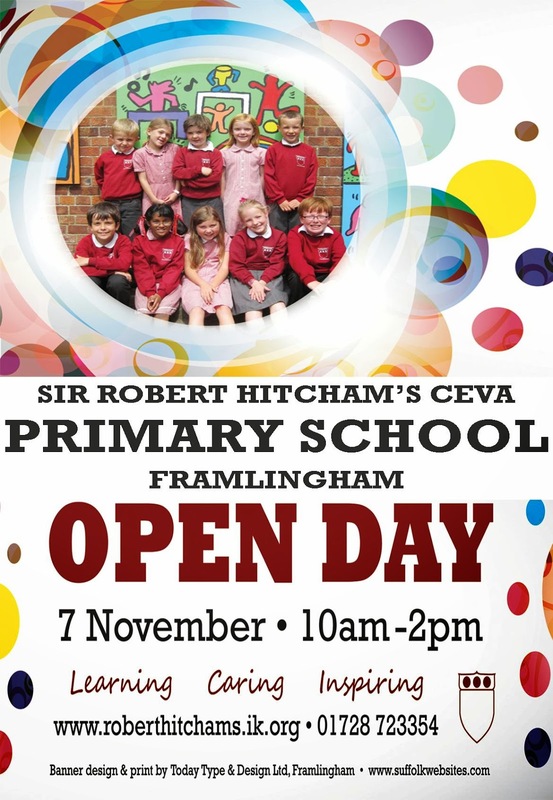 If you have any friends or neighbours who may be interested in considering our school for their children, do please encourage them to come along that day to take a tour of the school and see us in action! Framlingham Rotary Club donated free illustrated dictionaries to each of our year 6 children in assembly. Please return the slip by Tuesday 5 November but DO NOT SEND PAYMENT YET. Please pay on Monday 16 December if you are having a school lunch. We cannot send the boxes if there is no £2.50 to cover the transport costs, so please only send in shoeboxes with the accompanying £2.50. Please return the filled shoe boxes to school by FRIDAY 8 NOVEMBER so that we can arrange collection. THANK YOU. Thank you to all those parents who donated food gifts for Harvest which will be taken to the West Villa Homeless Families Unit in Ipswich and the collection at the end of the KS1 / KS2 service raised £177 will go to the Soup Kitchen in Ipswich. A separate letter for the Quiz night will be sent home this week; please do gather your family & friends to come along to socialize and have some fun. 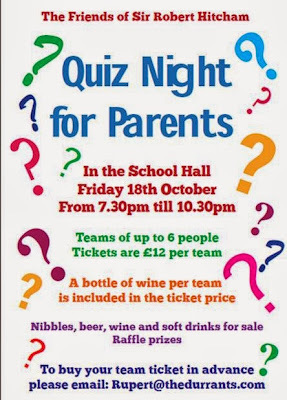 Pit your wits against other teams at this adult quiz evening with questions set by Mr Brook. There will be a licensed bar available. Each team is allowed up to 6 people and will cost £12 per team; this includes a bottle of wine on your table. We recently asked for shoe boxes for class KV, but PL/DD & RV also need them for a project in class. If you have a spare that you are not using for the Christmas Shoebox appeal (above) then please pass them to the class teachers. Thank you. & remember to sign them at the bottom. Please can you remind your child on a daily basis whether they are catching the bus home? On a daily basis we have children who are unsure how they are getting home. Thank you. We have pupils who are currently suffering from a bout of this bug, and would like to remind parents that in line with the HPA (Health Protection Agency) guidelines pupils should remain at home for 48 hours after the last bout of sickness or diarrhoea. Please help to reduce the spread of this by not returning your child to school before they are fully recovered. Thank you. Can we remind parents of class EM & NS that the children will start their 5 weeks of swimming lessons NEXT Wednesday (16 October). Please can we remind parents that the children in Key Stage 2 should wear PLAIN coloured PE shirts for their house (Red, Blue, Green or Yellow). T-shirts should not have slogans printed on them. They are available to buy from the Friends, via a uniform order form from the office or off the website. On a recent visit the SCC Road Safety Officer has alerted his concern about parents (with children) crossing directly at the bottom of Love Lane, and not using the Crossing Patrol. Please can we stress the importance of safely crossing this road, and of setting the right example to the children of ALWAYS USING THE CROSSING PATROL when they are in place. Thank you. Please note they MUST be returned to the Admissions Team at Ipswich by 15 January 2014. DO NOT – our school is open as usual for our pupils.